This item is part of the found pottery collection from the Alpujarra de la Sierra (Spain) with original blue and cream glaze preserved. It was found in a recently ploughed olive grove on the outskirts of Válor. The aim of this project is to preserve what is left of the beautiful coloured glaze remaining on these pieces,and to further enhance the colours by hand painting on the surface. The outcome is a collection of small hand painted and oil gilded brooches each being one of a kind. 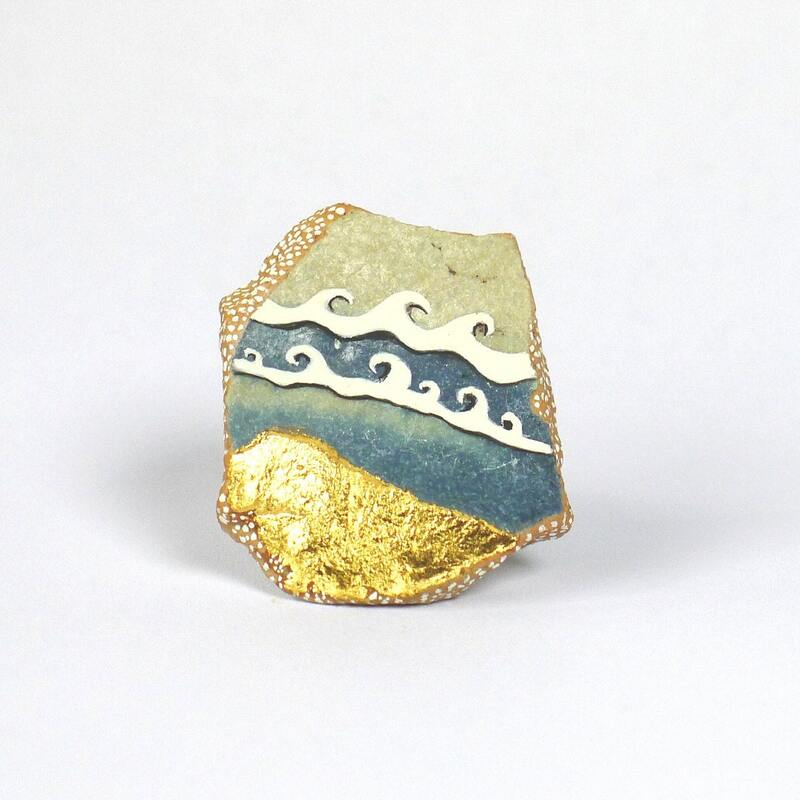 This brooch has painted waves and dots with titanium white egg tempera and oil gilded beach in 24ct gold leaf. It has been coated with several layers of acrylic glaze and has a silver plated 2.5mm brooch backing attached with an epoxy resin adhesive. Turtle Dreaming is a blank greetings card perfect for any occasion especially for Summer when we dream of the sea. Folksy :: Buy "Vintage Sea Tumbled Shards Adjustable Ring & Pendant Set"
Folksy :: Buy "Porcelain lighthouse brooch"
Folksy :: Buy "Dolphin pewter brooch"